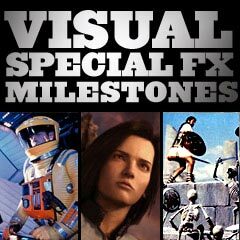 Special FX brought this epic James Cameron film recognition by the Academy - Best Achievement in Visual Effects for Industrial Light & Magic (ILM), defeating The Adventures of Baron Munchausen (1988) and Back to the Future Part II (1989). It employed both revolutionary, never-before-seen techniques and traditional effects (including miniature models, matte paintings, rear projection, and stop motion). It told about the crew of an experimental underwater oil drilling platform, led by Virgil "Bud" Brigman (Ed Harris) and a team of Navy SEAL divers led by Lt. Coffey (Michael Biehn) who were investigating the sinking of a US submarine in the Caribbean. One of their encounters was with underwater-dwelling aliens. Visual effects, especially of the watery, snake-like alien creature, a 'pseudopod,' represented the first example of digitally-animated, CGI water. This was the first computer generated three-dimensional (3-D) character - real cutting-edge technology. The film exhibited seamless and convincing compositing of 3-D animation together with 70 mm live-action footage. In the alien water-probe sequence lasting about 75 seconds (requiring 8 months of work), the water-based life form called a water pseudopod, with a realistic watery tentacle or vertical column of water, replicated (or emulated) Lindsey Brigman's (Mary Elizabeth Mastrantonio) facial expressions and appeared to communicate by movements that resembled her facial expressions. She also touched the virtual creature with her hand, and tasted the substance on her finger, pronouncing it: "Sea water." An Encounter with the Pseudopod: "Digital Water"
Computer-controlled camera work, called VistaGlide, allowed three characters (all performed by one actor, Michael J. Fox) to match up and interact seamlessly in the same scene (the dehydrated "instant pizza" dinner scene), through impressive split-screen photography. Fox played three characters (Marty Sr., Marty Jr., and Marlene) in the same scene, with a moving boundary between the three sections of the split-screen. It was the first film to accomplish interaction between the same actor on the screen as more than one character. Another special F/X sequence was the airborne hoverboard chase scene -- the hoverboards were fictional futuristic skateboards without wheels -- merely special F/X creations. Actors (standing on glued-on or attached hoverboards) were held up in the air by a rig on the back of a truck and driven around - pulled on wires (later digitally removed), making them appear to be floating and sailing in mid-air. In some scenes requiring closeups, the action was filmed in front of a bluescreen, to later be filled in with matching background footage. There was a brief sequence of CGI in a holographic shark used to promote a fictional Jaws 19 playing at a theatre - that threatened to chew into Marty - an example of personal targeted advertising. The third installment of the Indiana Jones franchise was about the late 1930s search for the authentic Holy Grail, in competition with the Nazis, to attain its life giving properties. The first all-digital composite shot, to demonstrate rapid aging (and death), was during Nazi sympathizer Walter Donovan's (Julian Glover) death sequence in the film's conclusion. It was learned that the immortal Grail guardian Knight (Robert Eddison) had hidden the real sacred Grail among lots of other glittering cups. The Knight advised Donovan: "Choose wisely." Dr. Elsa Schneider (Alison Doody) chose what she believed was the true Grail - a solid gold, emerald-encrusted goblet. She tricked Donovan into drinking from this false Holy Grail cup. He drank and then realized something was wrong ("What is happening to me?"). The Knight calmly observed that it was the wrong cup: "He chose...poorly." His hair suddenly sprouted, and he quickly perished from immediate decomposition when his body aged rapidly. His skeletal remains shattered and disintegrated into dust. The effect was accomplished by filming different images of the actor's make-up applied from beginning to end. ILM scanned the several filmed makeup transformations of his facial demise and "morphed" the multiple scanned film elements together digitally - it sent the output back to film (with a laser) rather than arranging film elements with an optical printer. This action comedy was based on Chester Gould's 1930s comic strip character of the same name, portrayed by actor Warren Beatty. The film was remarkable in that it was entirely shot on backlots and sound stages (not on-location). Traditional special effects techniques were used, such as miniature models and matte paintings. The production design (Oscar-winning for Art Direction) was entirely of only six brilliant solid colors (from the original strip): mostly red, green, blue, yellow, orange, and purple, plus black and white, to create a garish fantasy world. In future years, commonly-used CGI would create immersive backgrounds more easily. It was the first major feature film release with a digital audio soundtrack (Danny Elfman's film score). Director Renny Harlin's action film was the second in the long-running film franchise. In the film's final scene, it marked the first instance of a film using a traditional matte painting (created at ILM) that had been photographed and scanned into a computer, and then digitally-composited with elements of live-action footage (people, lights and steam). The film also contained extensive blue screen compositing for a sequence in which John McClane (Bruce Willis) ejected himself out of an exploding plane's cockpit filled with grenades. Disney's The Rescuers Down Under (1990), the sequel to their hit The Rescuers (1977), was the studio's very first, theatrically-released animated sequel. It was noteworthy for two other milestones. The animated feature film was the first 100% completely-digital feature film ever produced and released - it included impressive flight-aerial action sequences using rotoscoping and multi-plane cameras -- especially in the scene of Cody (voice of (Adam Ryen) setting free and riding the magnificent golden eagle Marahute. It was also the first animated feature film fully using CAPS (Computer Animation Production System) - the first digital (or computerized) ink-and-paint system (developed by Disney and Pixar), to color the film with computerized ink and paint (not using acetate cels or traditional paint). This feature film sequel from director Irvin Kershner (his last film) had the tagline: "He's Back to Protect the Innocent." It was set in the futuristic, dystopian urban location of Detroit, Michigan (although filming was mostly in Houston, Texas), and was a continuation of the story about a superhuman cyborg law enforcer called RoboCop. Eight separate animation units worked for nearly four months to complete the project. The finale of the action-crime film demonstrated the first use of real-time computer graphics or "digital puppetry" to create a character's face. RoboCop fought the Cain cyborg by jumping onto its back so that he could disengage the cyborg's brain center. RoboCop finally penetrated the chamber holding the organic remains of Cain's drug-crazed brain, ripped it out, and smashed it on the pavement. The lobotomized monster fell to the ground in a heap of metal. A CG representation or version of Cain's face was seen on the robot's monitor screen mounted on his head during the struggle. The facial movements were manipulated by a computer operator, in real-time, rather than using pre-programmed commands. When the organic brain was smashed, Cain's face reacted in pain - and then the transmission went dead. One of the main scenes with special effects was the underground train station shootout sequence, in which passengers walked through a giant X-ray machine about 20 feet in length. However, the first effort to animate the skeleton characters using motion capture failed. Then, it worked by rotoscoping the film (shot in low light) and using keyframes - still making use of on-set reference footage. This was a classic monster film about threatening, subterranean worm-like creatures in the Nevada desert - a variation on the Jaws movies. Just before the CGI era was fully initiated, this marked the end of creature features with life-sized models. A full-sized underground graboid monster (a giant, phallic-shaped, carnivorous worm) was not revealed in the film until the characters also saw it. The special effects company Amalgamated Dynamics, before it became well-known, was called upon to create an animatronic full-scale creature model. It also built three mechanical, full-length, state-of-the-art tentacles. This dramatic thriller film from director Ron Howard about Chicago firefighters featured the first use of photorealistic CG fire in a motion picture (from ILM). In some instances, fire was unrealistically portrayed as a living entity. Beauty and the Beast (1991) was the first full-length animated film to be nominated for Best Picture by the Academy of Motion Pictures Arts and Sciences. It was based on the fairy tale La Belle et la Bête by Jeanne-Marie Leprince de Beaumont. The definitive live-action version of the story was director Jean Cocteau's Beauty and the Beast (1946). It was noted for its major new direction for film effects -- the integration of traditionally hand-drawn cels and computer-generated animation, especially in the ballroom scene in which Belle and the Beast danced. It was the first film in which traditionally hand-drawn characters appeared in a 3D background. Every frame of the film was scanned, created, or composited within Disney's computer animation production system (CAPS) co-developed with Pixar. Computers were used to assist in adding colors and shadows to create 3-D like images within a completely 3-D rendered background, and to simulate complex movements (by tweening motion between frames) in 3-D space. Director John Milius' action war-drama was set during the Vietnam War era, with its many Navy aerial bombing missions and combat sequences. There were over 30 software-created shots of photo-realistic aircraft, cluster bombs, and smoke in full daylight. And there was a miniature 1:160 scale model of the city of Hanoi for the unauthorized bombing mission "downtown" behind enemy lines of "Sam City" (a missile depot). Digital morphing technology was extensively used in this sixth film (and the last film in the original series) in the popular Star Trek franchise. Accused of assassination, Captain James T. Kirk (William Shatner) and Dr. Leonard McCoy (DeForest Kelley) were tried and sentenced to life imprisonment on the frozen asteroid of Rura Penthe, a snowy hard-labor prison camp. There, they were befriended by shape-changing, yellow-eyed, alien chameloid criminal-prisoner Martia (Iman), who promised to help them escape, but in reality was planning to kill the two and make it look accidental. During the actual escape, Martia morphed from a hulking, hirsute "Brute" male alien (Tom Morga) into a little blonde child (Katie Jane Johnston) to escape her chains and neck restraint. Give a girl a chance, Captain. It takes a lot of effort. Kirk immediately suspected that she was leading them into a trap, and she admitted that she was - and would be compensated with a "full pardon." To create an imposter and confuse them, Martia morphed into Kirk himself, culminating in a fist-fight between the two. The film also featured a CG view of zero-gravity, Klingon blood (a pink-purple color), a sample that was magnified on a monitor from a microscopic view. Director James Cameron's film won the year's Academy Award for Best Achievement in Visual Effects, defeating Backdraft (1991) and Hook (1991). Terminator 2 was the first mainstream blockbuster movie with multiple morphing effects and simulated natural human motion and realistic movements for a major CG character. It was the first film to use 'personal' computers to create its special effects, supplementing its traditional use of puppets and other practical effects. The lethal, liquid-metal, chrome T-1000 cyborg terminator (Robert Patrick) was the first computer graphic-generated main character to be used in a film. He was capable of 'morphing' into any person or object. The liquifying-solidifying robot's humanoid texture was layered onto a CG model to create the effect. Over 300 special effects shots made up 16 minutes of the film's running time. The seemingly-indestructible Terminator android composed of morphing liquid metal was a killing, shape-shifting terminator with no emotional intelligence, usually exemplified as a policeman. The sleek, modern android was composed of poly-mimetic metal, meaning it could take on the shape, color, and texture of anything it touched (such as a porcelain-tiled floor or metal bars), and could also mimic human behavior, such as imitating the voices of its victims. It could transform its hands into jaw-like blades for impalement, and completely absorb shotgun blasts to its midsection or head. After a fiery big-rig crash in the LA flood channel, the T-1000 walked unscathed out of the flames - revealing his metallic frame before reverting back to humanoid form. In another remarkable scene, the T-1000 was shattered into pieces, but then the pieces reassembled themselves. Also, in post-production work, the truck crashing through the wall was flipped from left to right to create a better angle. In the same year, Michael Jackson's promo music video Black or White (1991), directed by John Landis, also used morphing (in its final sequence) - the first video to do so.